I have been blessed with writer friends who support me more than I ever support them. Sometimes we have one-way relationships like that in spite of our better intentions to be more supportive, more involved, more of what we cherish in other people. One of those wonderfully supportive, in spite of my failings, people is Johanna Harness. She went from a friendly and kind creator of words on Twitter to a person who has enriched my life with real, honest-to-goodness hugs. Yep, I’m blessed. Through no act on my part, Johanna invited me to be a member of the Amwriting community and blog, and during its tenure I wrote 6 “writerly” essays for it. The whole time I thought I should get my act together enough to write about my writing space, my writing process, my writing experience. Come clean as a writer, if you will. But the truth is, I put it off. 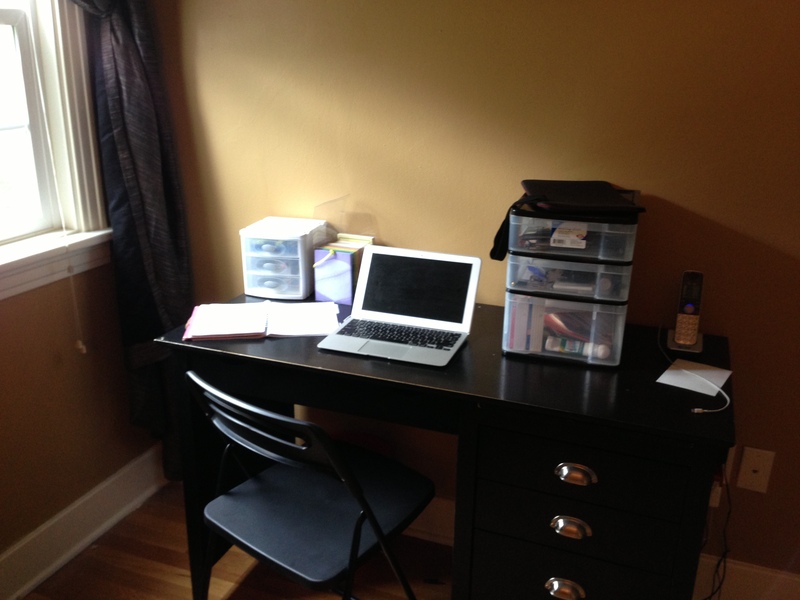 I kept waiting for a chance to post a before-and-after, both of writing spaces and writing experiences. I didn’t mind admitting my lack of organized writing space. I just didn’t want to admit to where I really was as a writer. Like most things in life, if you wait for the best time to be honest with yourself and everyone else, you lose the chance. Amwriting is evolving into an archive of writing rather than an on-going blogging platform. I applaud Johanna for recognizing the benefit of making that change. But this post has floated around in my head, as well as in the photo album of my smart phone as I had diligently taken photos for the post I kept thinking I would someday write. I need to get it out of my head so I can let it go. There is a part of me that finds sharing here, on my blog, easier than on a website with a huge platform. I suppose it’s a peccadillo that might not make sense. But here at Ten Minute Missive, it seems somewhat safer admitting my failure than on a writing site. Because if my writing space reflects anything about me and my experiences as a writer, it reflects a sad lack of quick forward motion. Sure, there’s movement, but it is of a glacial sort. I wrote The Blue Dress mostly late at night at my kitchen table. The whole time I tapped my keyboard keys at 1 am, I thought about what I would do when it was published. I would have a real writing space and I wouldn’t have sticky spots or pizza grease on my notes anymore. I would be a real writer and write in a real writer’s room. What was once the study, aka, kid central. It meant that I had to deal with the chaos of that space and all its stuff before I could move them out and myself in. Because I avoided the room like the plague, it was really a catch-all of chaos otherwise known as bill paying, American Girl doll playing, video game obsessing. I cleaned this room once every six months whether it needed it or not. It required much attention to turn it from what it was, into what it could be. But if a writer wants a writing room of her own, she must gird her literary loins, don a dust mask and get busy. So that’s what I did. My project, not quite half done. Like most horrid projects, I got sidetracked by reality and so instead of a writing room, I had a space even worse than before. I had a potential writing room. And we all know that potential is a dangerous place. Something with potential hangs over your head, reminding you of your dreams and then holds up your reality in stark contrast. In the case of the room, the process of finding a home for all that stuff was so overwhelming that I literally closed the door for several months and avoided it. Paid medical bills, the file for our lawsuit, pens that dried up years ago, bent paperclips, crushed crackers. I was exhausted just thinking about it. Closing the door was easier. 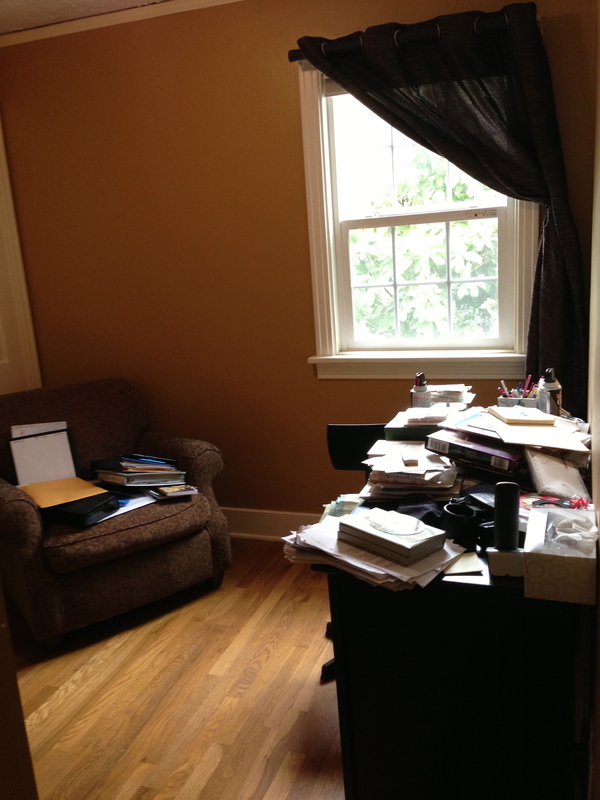 The fact that my writing room project so closely mirrors my writing experience torments me to no end. I have written a novel. I have revised that novel several times. And now it all just sits. Waiting for me to find the energy to finish the process of taking it from a potential book to a real book. Or to finally give up on it and be able to write something new. In order for that to happen, something else needs to happen first. I’m not sure exactly what. I just know it hasn’t happened yet. And that not happening bit, is slowly breaking my writer’s heart. I suppose it’s a confidence thing. That hearing so many “I really like your novel” and not a single “I love your novel enough to represent it” has stilled the wind beneath my writer’s wings. You have to be emotionally tough to make it as a writer and I’m pretty sure I exhausted all my emotional strength surviving my youth. As a writer, you have to take lots and lots of rejection in stride. You have to silently ignore the critics and just continue along on your merry little way, with all your fears and frustrations hidden from view, or at least shared with only a chosen few and a favorite combination of sugar, carbs, and fats. These are truths of the writing profession and I can cope with them. But when the critics are the voices in your own head, they are a bit more difficult to deal with. At least for me. Still a work in progress. But then, so am I. As far as my writing room, it looks better now. When we thought we might put our house on the market, it got a fast cleaning that isn’t really 100% complete yet, but was a step in the proper direction. I’m actually typing this post from that very desk, on that very laptop. And yet, my work here is far from finished in so many ways. So many of us are struggling. I suppose the trick is to just keep plugging along, plugging in, and being honest with how the journey is treating us. As for me, I hope to get myself a proper chair and a shake off these naysaying voices enough to get a decent start a my new project. And if nothing else, I may start writing and posting some flash fiction here, on my own safe corner of the internet. It’s time to make new words in this new space, even if neither is 100% complete. This entry was posted in Front Page, Writing and tagged Amwriting, Johanna Harness, writing process, writing spaces by kristina. Bookmark the permalink. awww hugs hon. I’m still at the write where ever you are stage. Sometimes at work, others at my desk at home and more often than not bits and pieces in notebooks and such. Keep sending The Blue Dress out, and while you’re at it, write another. You’ve got it in you I know it. Yup, what you said. It is hard to keep slogging along through the grey sometimes, and then, we may sit back and look at something from a different perspective, because we’re writers, and we can do that. If we have to. I guess. 😉 Those in-between things’ll gitcha won’t they? And yes, Johanna has been a great friend and mentor to a number of us through #amwriting, and I will certainly cherish the times I got to post there. ps – The newly claimed space looks dandy! One day I might share what my office space looks like now. It is really, REALLY bad. 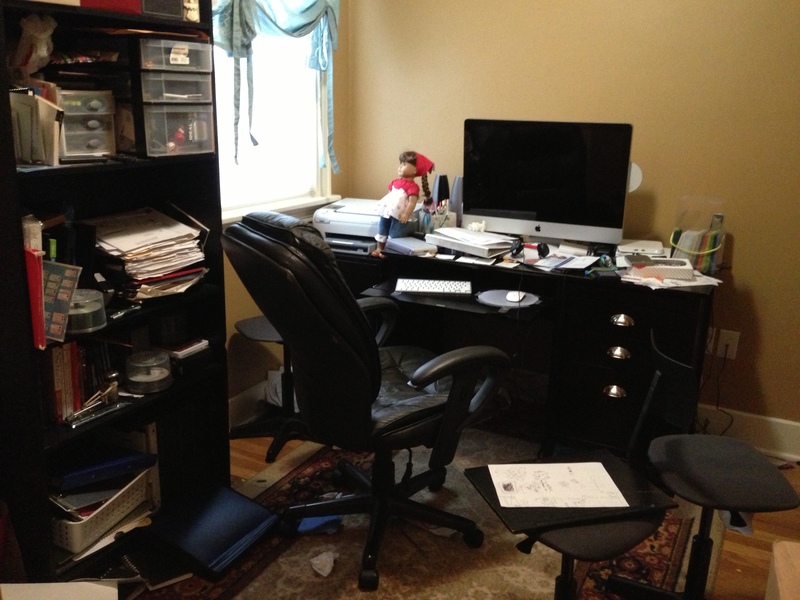 You can’t see a inch of desk space (with two desks) the floor is covered, and half the stuff in there shouldn’t be in there but it becomes “the dumping ground”. It will be a 2 day project to clean, but who has two entire free days. In all honesty, I’ll probably have to organize the house first. I get this post, far too well. “Something with potential hangs over your head, reminding you of your dreams and then holds up your reality in stark contrast.” – wow, that really hit home hard. Hang in there, and don’t feel too guilty for the friends that carry us on our journey because I truly believe, that there are those we carry without even realizing it. One of the most supportive communities I have ever experienced is the writing community. There isn’t a threat of “too much talent”. You can do this – enjoy your summer and your new space – I’ll be rooting for you! Thanks for the kind words, Kristina. FWIW, I never see you admitting your failure. I always see you speaking of what it means to be human–which includes admitting weaknesses. That’s what touches us as readers and that’s why we keep reading. You’re real and we feel safe with you. You are everything you need to be as a writer. The craft should be helping you express your experiences and views more fully and honestly. Make the craft work for you. Don’t try to change your life to suit the craft. Yes, that mini-lecture was for both of us. And for John too. 🙂 I’ve loved the writing you’ve both done for the blog and comfort myself by knowing that I can continue reading your writing on your own blogs. I have one of “those” blogs still floating in my head too, and it is nudging me, reminding me that if I don’t do it soon, I will have lost my chance…. however, you’ve helped me realize that to some degree, I won’t lose that chance…. but another form may still be available. However…. of I go to find some spot to write so I can give that blog some life.